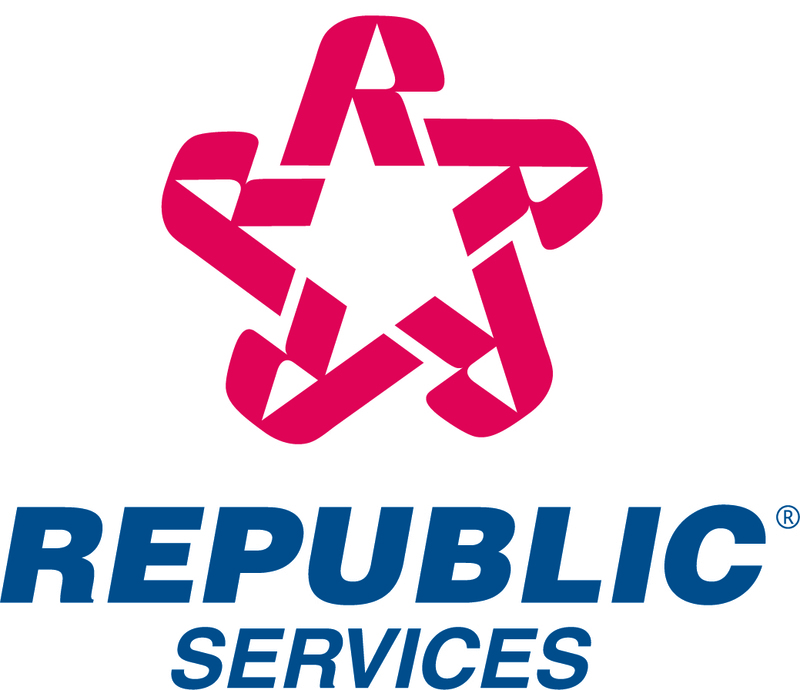 Republic Services, Inc. today reported that revenue for the three months ended December 31, 2007 increased 3.9 percent to $796.0 million compared to $766.2 million for the same period in 2006. Net income for the three months ended December 31, 2007 was $82.1 million, or $0.44 per diluted share, compared to net income of $66.9 million, or $0.34 per diluted share, for the same period in 2006. The Company's income before income taxes for the three months ended December 31, 2007 included a $12.5 million pre-tax gain ($5.0 million, or $0.03 per diluted share, net of tax) related to the sale of the Company's compost, mulch, and soil business in Texas. Operating income for the three months ended December 31, 2007 was $139.9 million, or 17.6 percent of revenue, compared to operating income of $129.7 million, or 16.9 percent of revenue, for the same period last year. Revenue for the year ended December 31, 2007 increased 3.4 percent to $3,176.2 million from $3,070.6 million for the comparable period in 2006. Net income for the year ended December 31, 2007 was $290.2 million, or $1.51 per diluted share, compared to $279.6 million, or $1.39 per diluted share, for 2006. The Company's income before income taxes for the year ended December 31, 2007 includes $54.9 million of pre-tax charges ($33.8 million, or $0.18 per diluted share, net of tax) related to estimated increases in costs to remediate landfills in Ohio and California. The Company's income before income taxes for the year ended December 31, 2007 also includes a $12.5 million pre-tax gain ($5.0 million, or $0.03 per diluted share, net of tax) related to the sale of the Company's compost, mulch, and soil business in Texas. Net income for the twelve months ended December 31, 2006 included a $5.1 million tax benefit related to the resolution of various income tax matters. Operating income for the year ended December 31, 2007 was $536.0 million, or 16.9 percent of revenue, compared to operating income of $519.5 million, or 16.9 percent of revenue, for 2006. Excluding the $54.2 million of operating expenses included in the charges for the costs to remediate two of the Company's landfills in Ohio and California, operating income for the year ended December 31, 2007 would have been $590.2 million, or 18.6 percent of revenue. James E. O'Connor, Chairman and Chief Executive Officer of Republic Services, Inc. stated, "In 2007, we experienced another record-setting year. Revenue grew 3.4 percent for the full year. Operating margins improved 70 basis points during the fourth quarter to 17.6 percent. Our employees did an excellent job of executing our business plan during 2007. It was our team focus that allowed the Company - in spite of weaker residential construction - to exceed our goals for earnings per share and free cash flow for the year." Republic Services also announced that its Board of Directors declared a regular quarterly dividend of $0.17 per share for shareholders of record on April 1, 2008. The dividend will be paid on April 15, 2008. During 2007, Republic repurchased 11.1 million shares, or 5.7 percent, of Company stock for a total of $362.8 million. Separately, the Company announced that its Board of Directors approved an additional $250 million common stock repurchase program. At December 31, 2007, the Company had $136 million remaining under its existing share repurchase program which was approved in July 2007. Combined, the Company has the authority to repurchase $386 million of its common stock. The Company expects this combined authorization to be fully utilized by mid-2009. Republic Services' objectives for 2008 remain consistent with previous years and once again focus on enhancing shareholder value through the generation and efficient use of free cash flow. The Company remains committed to implementing a broad-based pricing initiative across all lines of service to recover increasing costs. The Company anticipates using free cash flow to repurchase common stock under its stock repurchase programs and to pay regular quarterly dividends. Republic's guidance is based on current economic conditions and does not assume any deterioration or improvement in the overall economy in 2008.
range of $1.78 to $1.82. Company's consolidated statements of cash flows. expected to be down .5 to 1.5 percent. spending of approximately $325 million. Republic Services, Inc. is a leading provider of solid waste collection, transfer, and disposal services in the United States. The Company's operating units are focused on providing solid waste services for commercial, industrial, municipal, and residential customers. The following information should be read in conjunction with the Company's audited Consolidated Financial Statements and notes thereto appearing in the Company's Form 10-K as of and for the year ended December 31, 2006. It should also be read in conjunction with the Company's Unaudited Condensed Consolidated Financial Statements and notes thereto appearing in the Company's Form 10-Q as of and for the nine months ended September 30, 2007. In January 2007, the Company's Board of Directors approved a 3-for-2 stock split effective on March 16, 2007, to stockholders of record as of March 5, 2007. The Company distributed approximately 64.5 million shares from treasury stock to effect the stock split. The Company's shares of treasury stock, earnings per share and weighted average common and common equivalent shares outstanding have been retroactively adjusted for all periods to reflect the stock split. The Company adopted the provisions of FASB Interpretation No. 48, "Accounting for Uncertainty in Income Taxes" ("the Interpretation") effective January 1, 2007, as required. As a result of adopting the Interpretation, the Company recorded a $5.6 million cumulative adjustment to decrease retained earnings. During the first quarter of 2007, the Company recorded $4.2 million of additional income taxes related to the resolution of various income tax matters. During the second quarter of 2007, the Company recorded a $5.0 million reduction in income taxes related to the resolution of various income tax matters, which effectively closes the Internal Revenue Service's audits of the Company's consolidated tax returns for fiscal years 2001 through 2004. The Company expects its effective tax rate for 2008 to be approximately 38.5%. During the first quarter of 2007, the Company recorded a pre-tax charge of $22.0 million ($13.5 million, or $.07 per diluted share, net of tax), related to estimated costs the Company believed would be required to comply with Final Findings and Orders ("F&Os") issued by the Ohio Environmental Protection Agency ("OEPA") in response to environmental conditions at the Company's Countywide Recycling and Disposal Facility ("Countywide") in East Sparta, Ohio. The Company also incurred approximately $3.3 million of additional amortization and depletion expense during 2007 associated with a reduction of estimated remaining available airspace at this landfill as a result of the OEPA's F&Os. The Company has complied with and will continue to comply with the F&Os. However, while there are indications that the reaction is beginning to subside, the Company nevertheless agreed with the OEPA to take certain additional remedial actions at Countywide, including creating multiple barriers in the landfill to further isolate the reaction. Consequently, the Company recorded an additional pre-tax charge of $23.3 million ($14.4 million, or $.08 per diluted share, net of tax) during the three months ended September 30, 2007. The majority of these additional costs will be paid during fiscal 2008. While the Company is vigorously pursuing financial contributions from third parties for its costs to comply with the F&Os and the additional remedial actions, the Company has not recorded any receivables for potential recoveries. Also during the third quarter of 2007, the Company recorded a pre-tax charge of $9.6 million ($5.9 million, or $.03 per diluted share, net of tax) associated with an increase in estimated leachate disposal costs and costs to upgrade onsite equipment that captures and treats leachate at the Company's closed disposal facility in Contra Costa County, California. These additional remediation costs are attributable to a consent agreement with the California Department of Toxic Substance Control. The majority of these additional costs will be paid during fiscal 2008. It is reasonably possible that the Company will need to adjust the charges noted above to reflect the effects of new or additional information, to the extent that such information impacts the costs, timing or duration of the required actions. Future changes in the Company's estimates of the costs, timing or duration of the required actions could have a material adverse effect on the Company's financial position, results of operations or cash flows. During the three months ended December 31, 2007, the Company divested of its compost, mulch and soil business in Texas and recorded a pre-tax gain of $12.5 million ($5.0 million, or $0.03 per diluted share, net of tax) on the sale. The Company believes that the presentation of operating income before depreciation, amortization, depletion and accretion is useful to investors because it provides important information concerning the Company's operating performance exclusive of certain non-cash costs. Operating income before depreciation, amortization, depletion and accretion demonstrates the Company's ability to execute its financial strategy which includes reinvesting in existing capital assets to ensure a high level of customer service, investing in capital assets to facilitate growth in the Company's customer base and services provided, pursuing strategic acquisitions that augment the Company's existing business platform, repurchasing shares of common stock at prices that provide value to the Company's shareholders, paying cash dividends, maintaining the Company's investment grade rating and minimizing debt. This measure has material limitations. Although depreciation, amortization, depletion and accretion are considered operating costs in accordance with GAAP, they represent the allocation of non-cash costs generally associated with long-lived assets acquired or constructed in prior years. The change in cash provided by operating activities during the periods presented is primarily due to the payment of $83.0 million for income taxes made during the year ended December 31, 2006 related to fiscal 2005 that had been deferred as a result of an Internal Revenue Service notice issued in response to Hurricane Katrina. The adjustments noted above do not affect either the Company's net change in cash and cash equivalents as reflected in its consolidated statements of cash flows or its free cash flow. The Company believes that the presentation of free cash flow provides useful information regarding the Company's recurring cash provided by operating activities after expenditures for property and equipment, net of proceeds from sales of property and equipment. It also demonstrates the Company's ability to execute its financial strategy as previously discussed and is a key metric used by the Company to determine compensation. The presentation of free cash flow has material limitations. Free cash flow does not represent the Company's cash flow available for discretionary expenditures because it excludes certain expenditures that are required or that the Company has committed to such as debt service requirements and dividend payments. The Company's definition of free cash flow may not be comparable to similarly titled measures presented by other companies. Capital expenditures include $3.0 million and $2.7 million of capitalized interest for the twelve months ended December 31, 2007 and 2006, respectively. As of December 31, 2007, accounts receivable were $298.2 million, net of allowance for doubtful accounts of $14.7 million, resulting in days sales outstanding of approximately 33.8 (or 20.0 net of deferred revenue). In the second quarter of 2007, the Company recorded a $4.3 million reduction to its allowance for doubtful accounts as a result of the Company refining its estimate of its allowance for doubtful accounts based on its historical collection experience. During the three months ended December 31, 2007, the Company paid $70.7 million to repurchase 2.1 million shares of its common stock. During the twelve months ended December 31, 2007, the Company repurchased a total of 11.1 million shares of its common stock for $362.8 million. As of December 31, 2007, the Company was authorized to repurchase up to an additional $136.4 million of its common stock under its existing stock repurchase program. In January 2008, the Company's Board of Directors authorized the repurchase of an additional $250 million of Company stock. Combined, Republic has the authority to repurchase $386.4 million of its common stock. In October 2007, the Company paid a cash dividend of $31.8 million to shareholders of record as of October 1, 2007. As of December 31, 2007, the Company recorded a dividend payable of $31.6 million to shareholders of record at the close of business on January 2, 2008, which has been paid. In January 2008, the Company's Board of Directors declared a regular quarterly dividend of $.17 per share payable to shareholders of record as of April 1, 2008. +1-954-769-2387, or Ed Lang, +1-954-769-3591, all for Republic Services, Inc.